A Dental Bridge is used to fill the gap when you have lost one or more teeth – restoring your smile and enhancing your dental function. If you have lost a tooth or multiple teeth, you may feel self-conscious or might have noticed a change in the way you eat and occasionally, even the way you speak. Bridges are a trusted and proven restorative treatment to replace missing teeth. 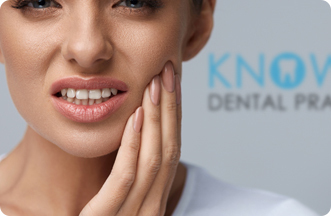 At Knowle Dental Practice, our experienced dentists use bridges to replace one missing tooth or a number of teeth missing in a row. 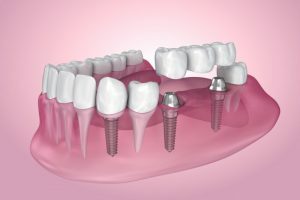 A Dental Bridge is a prosthetic tooth, which has been built specifically for you. If you require a bridge, your dentist will fit crowns on the teeth either side of the gap which then act as an ‘anchor’ for the Dental Bridge. The bridge is then fitted into place and quite literally ‘bridges’ the gap left behind by a lost tooth. To bring your smile back to health and restore missing teeth, please click here or call 0117 977 6567 to speak to a member of our team.